The May 1948 Board meeting accepted the California Solid Color Fanciers as a member. 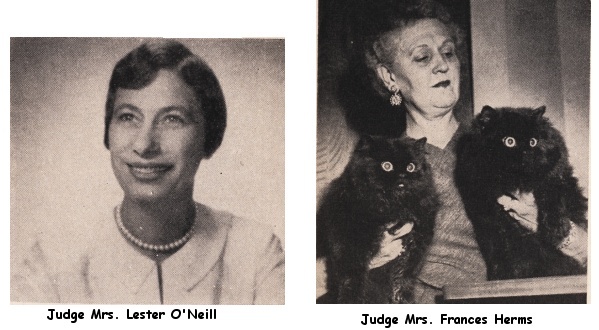 At this meeting the names of Mrs. Lester O’Neill and Mrs. Frances Herms were added to the list of judges. For some time Miss Goodwin had served as Secretary-Treasurer of the Association. The May meeting read a letter from her in which she stated that the burdens of the joint office were taxing, and submitting her resignation as Secretary. 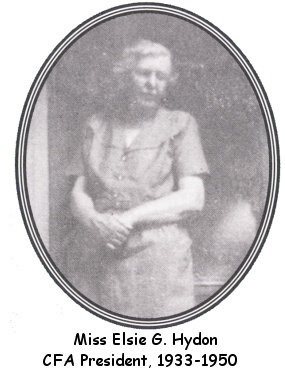 Mrs. Karl B. Norton was elected as Secretary of CFA. The November 1948 meeting reported with regret the death of Mrs. Gertrude Tyalor. The Board was advised also of the illness of Mrs. Warfel Smith and Mrs. Stewart. The name of Mr. Sven Nelson was added to the judges list. The Secretary reported that a second shipment of canned food had gone to England, and that many letters of appreciation had been received from cat fanciers there. Mrs. Karl Norton was elected to the Board to fill out the term of Mrs. Warfel Smith. The 1949 Annual Meeting was held on February 24. The Fort Wayne Cat Fanciers was accepted as a member. The popularity of Siamese had resulted in appeals having been made to the Board by Siamese breeders for a requirement that a judge who was a Siamese breeder be required to judge Siamese in an all breed show. Mr. Nelson brought this up at the annual meeting and a lively discussion ensued. It was apparent that the Siamese breeders were unhappy over the results in all breed shows and blamed the situation on the traditional long hair background of the experienced all breed judges. The economic effect of requiring two judges caused the meeting to vote down the recommendation, but the Siamese breeders remained unhappy with the recommendation that all breed judges become more familiar with Siamese and the standards. To add to the problem, the Burmese suspension was again brought up, and was referred to the Board. Mr. Sven Nelson and Mr. James Brinning were elected to the Board in place of Miss Goodwin and Miss Glenz. All other officers and directors were reelected. 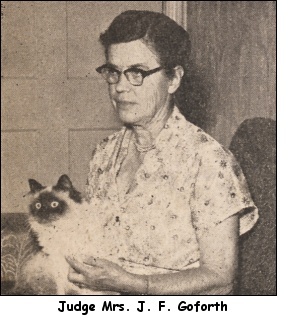 The June 1949 Board meeting accepted the All Breed Cat Club of New England into membership along with Mo-Kan Cat Club. At this meeting, Mrs. J.F. Goforth was added to the list of judges. During the summer, Mrs. Norton died. This sudden loss was a great shock to the Board, and resolutions deploring her death were passed at the October meeting. This meeting also elected Mrs. James E. O’Bryon to fill out the unexpired term of Mrs. Norton as Secretary. The November meeting named Mrs. O’Bryon as a Board member to fill out Mrs. Norton’s term. The Russian Blues were recognized as a breed at this meeting. The standard and classes in effect in England were adopted by CFA for the present. Mrs. Gladys Weirich was added as a judge to the CFA list. The 1950 Annual Meeting was a turbulent affair. It was called to order at 11:45am on February 23. Miss Goodwin, the Treasurer, reported that two clubs were asking that delegates be seated although one club had paid its dues that morning, and the other stood ready to pay its dues if its delegates would be seated. The chair then appointed a credentials committee. The committee reported that the clubs were indeed delinquent as stated by the Treasurer, but that the recommendation of the committee was that delegates therefrom be seated. The parliamentarian then pointed out that under the constitution only those clubs which were in good standing for not less than thirty days prior to the annual meeting, were entitled to vote. The chair ruled that the constitution took precedence over the recommendation of the credentials committee, and held that the two clubs involved would not be permitted to vote. Mrs. O’Bryon then objected to permitting two other clubs to vote, stating that they too were under the constitutional ban. Another credentials committee was appointed amid charges and countercharges from the floor. The credentials committee reported that the two latter clubs were likewise barred under the constitution. The parliamentarian then suggested that if the two objections were withdrawn, his ruling would be unnecessary, and the meeting could proceed with all four clubs voting as if the matter had never been brought up. Mrs. O’Bryon refused to withdraw her objection, and the four clubs were disenfranchised for that meeting. The vice president of the Association, Mrs. Orville Stewart had died since the last Board meeting, and the loss was reported to the Association with great sorrow. Miss Elsie G. Hydon who had been president of the Association for seventeen years, asked that she be relieved of her office, and from membership on the Board. With a great deal of regret, the meeting acceded to her request, but voted her the life time title of Honorary President. The meeting then elected Mrs. Harry P. Shipe as President; Miss Lillian M. Goodwin as Vice-President and Treasurer; and Mrs. James E. O’Bryon as Secretary. The following were then elected as members of the Board of Directors: Mrs. Harry P. Shipe, Miss Lillian M. Goodwin, Mrs. James E. O’Bryon, Mrs. John Hunter, Mrs. Anthony Avata, Mrs. Ralph Mabie and Mr. David Deans-Henderson.